Liu, F., Xu, Y., Wang, Y. and Wang, Y. (2018). Real-time PCR Analysis of PAMP-induced Marker Gene Expression in Nicotiana benthamiana. Bio-protocol 8(19): e3031. DOI: 10.21769/BioProtoc.3031. Perception of pathogen-associated molecular patterns (PAMPs) often triggers various innate immune responses in plants. The transcriptional changes of defense-related genes are often used as a marker to assay PAMP-triggered plant immune response. 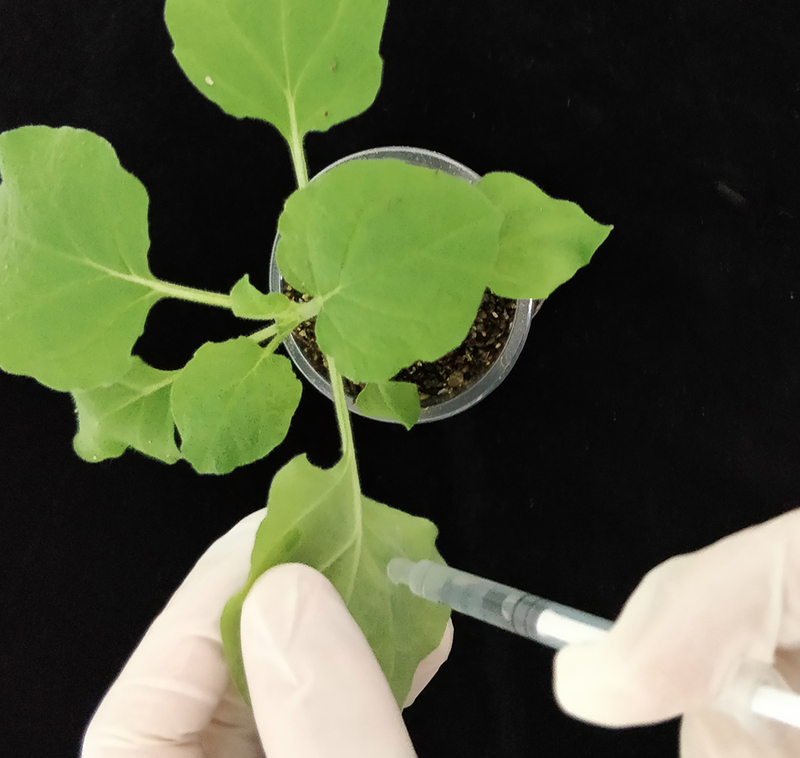 Here we described a protocol to monitor the relative expression level of marker genes in Nicotiana benthamiana upon treatment with PAMPs. The procedure includes leaf treatment using PAMPs, total RNA isolation, cDNA synthesis, quantitative real-time PCR and data analysis. This protocol is applicable to monitor marker gene expression triggered by different PAMPs in N. benthamiana. Pathogen-associated molecular patterns, namely PAMPs, are a class of molecules derived from pathogens and are relatively conserved across microorganisms. Multiple PAMPs such as flg22 and XEG1 (Felix et al., 1999; Ma et al., 2015), have been characterized that can be detected by plant cell surface localized pattern-recognition receptors (PRRs) and thereby induce PAMP-triggered immunity (Couto and Zipfel, 2016). One of the predominant PAMP-triggered responses is the activation of defense-related maker genes (Navarro et al., 2004; Zipfel et al., 2006). Nicotiana benthamiana has been used extensively as a model plants and is sensitive to multiple PAMPs. In N. benthamiana, the marker genes, such as NbCYP71D20, NbACRE31 and NbWRKY22, were previously found that are rapidly activated upon PAMP treatment (Heese et al., 2007; Segonzac et al., 2011; Wang et al., 2018). Here, we describe a detailed protocol for checking the PAMP-triggered marker gene expression in N. benthamiana. The relative gene expression was also determined in parallel using a negative control to exclude the background noise. N. benthamiana plants were grown in a growth chamber at 19-22 °C under long-day conditions (14-h-light/10-h-dark) and 70-80% relative humidity for 5-6 weeks as shown in Figure 1. N. benthamiana leaves of the same position and similar size were treated with PAMPs (e.g., flg22) or control (e.g., ddH2O) by infiltration using 1 ml needleless syringe (Figure 2). The infiltrated plant were dried gently using the tissue paper and kept in the growth chamber for 3-6 h before collected and frozen in liquid nitrogen. Total RNA was isolated from N. benthamiana leaves using E.Z.N.A.® Total RNA Kit I isolation kit according to the manufacturer’s instructions with proper modifications. Harvest the N. benthamiana leaves at 3-6 h after PAMP treatment. Grind the frozen tissues into powder with a mortar and pestle in liquid nitrogen. Transfer the leaf powder into the 1.5 ml RNase-free tube with 700 μl TRK Lysis Buffer and 14 μl β-mercaptoethanol, vortex the samples for 30 sec, and maintain the sample at 4 °C for 5-10 min. Centrifuge the samples at 15,000 x g for 5-10 min at 4 °C, carefully transfer 600 μl supernatant into a new 1.5 ml RNase-free tube. Add equal volume (600 μl) 70% ethanol (see Recipes). Add the mixed liquid into the HiBind® RNA Mini Column (assembled 2 ml collection tube), centrifuge at 10,000 x g for 30 sec at 4 °C. Discard the filtrate and reuse the collection tube. Add 300 µl RNA Wash Buffer I to the HiBind® RNA Mini Column, centrifuge at 10,000 x g for 30 sec at 4 °C. Discard the filtrate and reuse the collection tube. Add 500 µl RNA Wash Buffer I to the HiBind® RNA Mini Column, centrifuge at 10,000 x g for 30 sec at 4 °C. Discard the filtrate and change a new 2 ml collection tube. Add 500 μl RNA Wash Buffer II, centrifuge at 10,000 x g for 30 sec at 4 °C. Discard the filtrate and reuse the collection tube. Centrifuge at 10,000 x g for 2 min to completely dry the HiBind® RNA Mini Column. Put the HiBind® RNA Mini Column into a new 1.5 ml RNase-free tube, add 50 μl DNase/RNase-free ddH2O into Column, and let it sit at room temperature for 1 min. Centrifuge at 10,000 x g for 1 min at 4 °C to elute RNA from the HiBind® RNA Mini Column. Measure RNA concentration using NanodropTM 1000. Store the eluted RNA at -70 °C. Total RNA was reverse transcribed using PrimeScriptTM RT reagent Kit with gDNA Eraser (Perfect Real Time). Dilute the obtained cDNA 20 times with 180 µl RNase-free H2O. Add the qRT-PCR reaction mix into each wall of MicroAmpTM Optical 96-Well Reaction Plate with Barcode with three replicates for each sample. Seal the plate using MicroAmpTM Optical Adhesive Film, and centrifuge the plate at room temperature for 3 min using the MPS 1000 Mini PCR Plate Spinner. Ct (cycle threshold) values were collected and exported from the Sequence Detection Software v1.4.0. Relative expression of marker genes in each sample was normalized against the internal control (Endo), such as the housekeeping genes NbActin or NbEF1α, and was calculated using the formula: 2-ΔCT = 2-(Cttarget - CtEndo) calculated as ΔOD1-ΔOD2. The relative expression level of marker genes in PAMP-treated samples to the control-treated sample was calculated using the following formula: 2-ΔΔCT = 2-(ΔCTPAMP - ΔCTcontrol) (Figure 3). Figure 3. Transcription level changes of PTI marker gene CYP71D20 upon XEG1or flg22 treatment. Transcript levels were quantified by qRT-PCR and normalized to internal control NbEF-1α. Bars represent the mean fold changes (± S.E.M.) of the XEG1-treated or flg22-treated leaves relative to the value in control-treated leaves, which was set as 1. It is important to use plants of similar size. Leaves of different plants should be collected at the same position with similar size. The negative control should be included to measure the background level. Cross-contamination of the PAMPs and negative control should be avoided during infiltration. For each experiment, at least three replicates should be included for statistical analysis. Different PAMPs may induce the defense-related marker gene expression at different time points. The qRT-PCR program applies to Applied Biosystems 7500 fast Real-Time PCR System. This protocol was partially modified from the previously published paper by Wang et al. (2018). This work was supported by the China National Science Funds to Yuanchao Wang for Innovative Research Groups (Grant No. 31721004) and the funds to Yan Wang (Grant No. 31501622 and KJQN201663). Couto, D. and Zipfel, C. (2016). Regulation of pattern recognition receptor signalling in plants. Nat Rev Immunol 16(9): 537-552. Felix, G., Duran, J. D., Volko, S. and Boller, T. (1999). Plants have a sensitive perception system for the most conserved domain of bacterial flagellin. Plant J. 18: 265-276. Heese, A., Hann, D. R., Gimenez-Ibanez, S., Jones, A. M., He, K., Li, J., Schroeder, J. I., Peck, S. C. and Rathjen, J. P. (2007). The receptor-like kinase SERK3/BAK1 is a central regulator of innate immunity in plants. Proc Natl Acad Sci USA 104(29): 12217-12222. Ma, Z., Song, T., Zhu, L., Ye, W., Wang, Y., Shao, Y., Dong, S., Zhang, Z., Dou, D., Zheng, X., Tyler, B. M. and Wang, Y. (2015). A Phytophthora sojae glycoside hydrolase 12 protein is a major virulence factor during soybean infection and is recognized as a PAMP. Plant Cell 27(7): 2057-2072. Navarro, L., Zipfel, C., Rowland, O., Keller, I., Robatzek, S., Boller, T. and Jones, J. D. (2004). The transcriptional innate immune response to flg22. Interplay and overlap with Avr gene-dependent defense responses and bacterial pathogenesis. Plant Physiol 135(2): 1113-1128. Segonzac, C., Feike, D., Gimenez-Ibanez, S., Hann, D. R., Zipfel, C. and Rathjen, J. P. (2011). 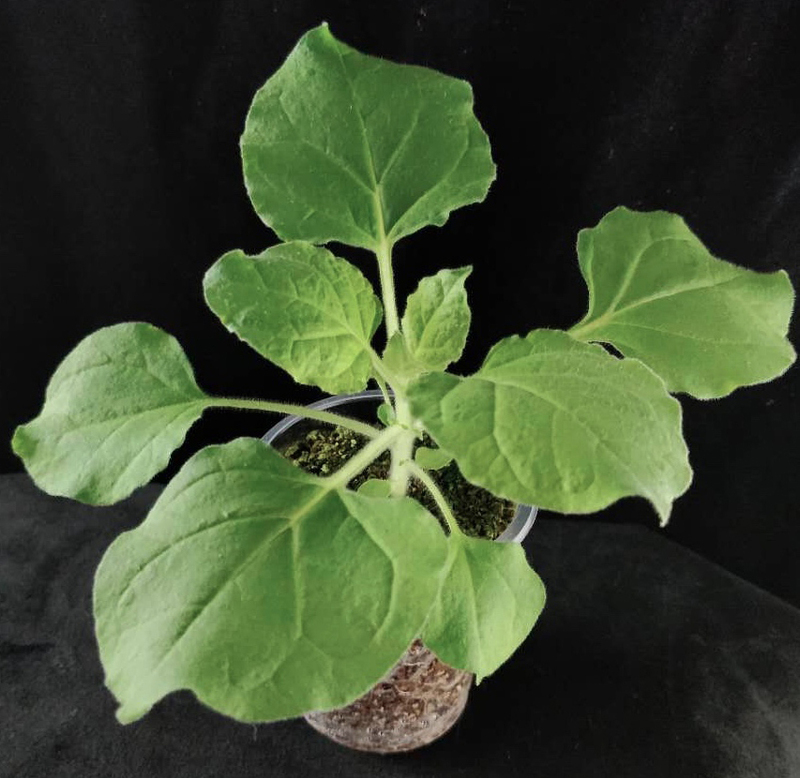 Hierarchy and roles of pathogen-associated molecular pattern-induced responses in Nicotiana benthamiana. Plant Physiol 156(2): 687-699. Wang, Y., Xu, Y., Sun, Y., Wang, H., Qi, J., Wan, B., Ye, W., Lin, Y., Shao, Y., Dong, S., Tyler, B. M. and Wang, Y. (2018). Leucine-rich repeat receptor-like gene screen reveals that Nicotiana RXEG1 regulates glycoside hydrolase 12 MAMP detection. Nat Commun 9(1): 594. Zipfel, C., Kunze, G., Chinchilla, D., Caniard, A., Jones, J. D., Boller, T. and Felix, G. (2006). Perception of the bacterial PAMP EF-Tu by the receptor EFR restricts Agrobacterium-mediated transformation. Cell 125(4): 749-760. How to cite: Liu, F., Xu, Y., Wang, Y. and Wang, Y. (2018). Real-time PCR Analysis of PAMP-induced Marker Gene Expression in Nicotiana benthamiana. Bio-protocol 8(19): e3031. DOI: 10.21769/BioProtoc.3031.